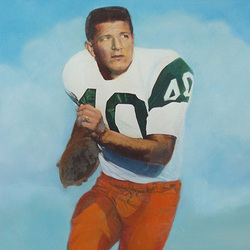 Pete Banaszak, who graduated from the University of Miami in 1966, went on to great fame in the National Football League as one of football's toughest runners and as one of the game's most dependable performers. As a Hurricane, Banaszak was a gutty player. Injuries hounded him throughout his UM playing career, cutting heavily into his playing time. Handicapped by a pulled hamstring muscle in his sophmore year, the jolting Wisconsin husky never gave up and when the campaign was over had gained more rushing yards than any two men on the team. In seven of Miami's 10 games in 1963, he had at least one run of 13 yards or more to his credit. Against Purdue, North Carolina, Florida, Pittsburgh, he churned ahead on bull-like gallops from 20 to 26 yards. His 261 rushing total was one of the highes ever recorded by a UM sophmore and his 18 pass interceptions rates high among former UM backfield stars. Battling weight problems and sustaining more leg injuries as a junior, Banaszak failed to live up to expectations, giving little help to the Hurricanes cause until a blaze-of-glory surge in the final half of the season. Banaszak got his weight under control and was healthy in 1965. He responded with 473 rushing yards on 111 carries for an average of 4.26, including a 46-yard gallop. He gained 65 yards on eight receptions, scored one TD, and on four kickoff returns, Banaszak gained 58 yards for a 14.5 yard average. For his career (1963-65), Banaszak gained 1,107 yards on 263 attempts and scored 12 TDs. During the three years he played, UM went 3-7, 4-5, and 5-4-1. The tie in 1965 came against Notre Dame and marked the only time UM did not go down in defeat at the hands of the Irish until the Hurricanes won in the Orange Bowl in 1981. Banaszak also left the makings of a team which would go 8-2-1 in the following season. After his college days at UM, Banaszak joined the professional ranks for a 12-year career with the Oakland Raiders.